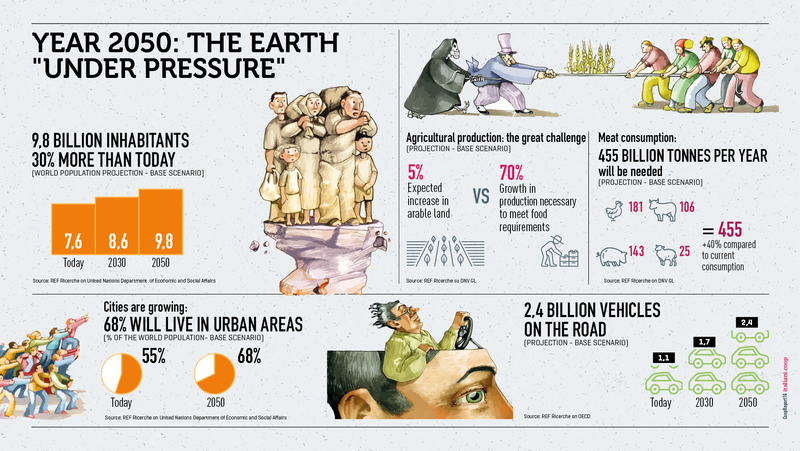 In the globalized world, fates of emerging and already industrialized countries are approaching, but the internal social distances increase dramatically and past instances are emerging again (the commercial and migratory neoprotezionismo, the anti-elite protest, old and new populism) alongside threats already known and increasingly urgent (overpopulation and climate change). Italy is an emblematic case, after almost 5 years, the increasingly slow recovery (+ 1.2% the expected variation of GDP in 2018 versus 1.5% effective in 2017), is to the benefit of a few, does not raise the destiniesof the middle class and pushes even lower the conditions of the families in greater difficulty. Basically those who are poor remain so: 62% of Italians who are in the lower 20% in income distribution remains in such situation even after 4 years, a percentage of 5.5% higher than the average of the 36 OECD countries. In 2017, Italy the tail light in Europe with a reduction in household consumption compared to 2010 of over 2% (-2.2%) compared to a solid + 12.7% in Germany, a +10 , 2% French and substantial Spanish stability (0.1%). 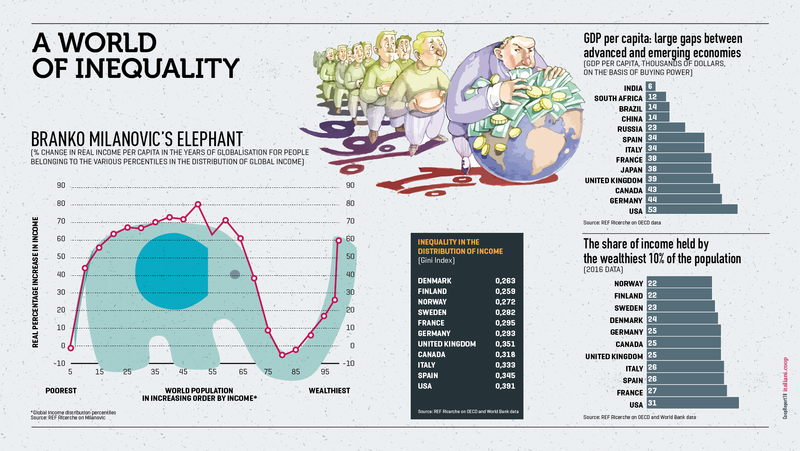 And even in the last year, the Italian + 0.7% is the lowest among the major european economies. The wealthy families spend 4 times more than those with low spending capacity and between a Trentino family and a Calabrian one the spread per year is equal to 17,000 euro. Polarized and divided, Italians adopt different behaviors depending on the economic resources, but also the place where they live, the age and employment they have, the level of education and their own approach to life. 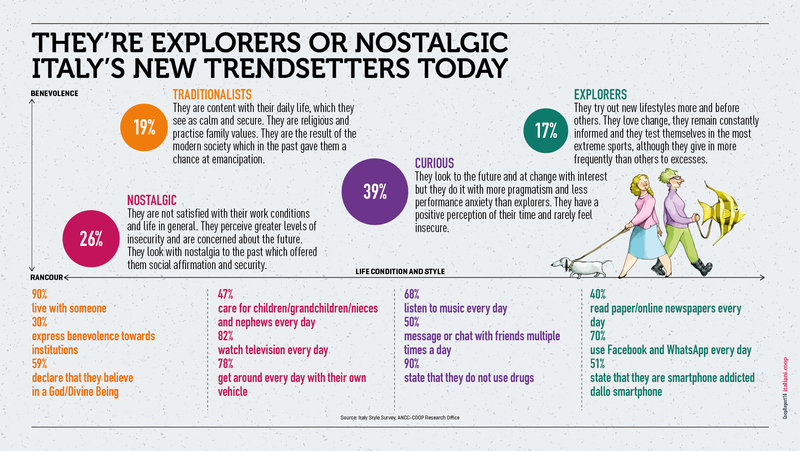 17% of Italians (aged 18-65) are “explorers”. Full expression of postmodern society they spend their existences in such liquid way – in behaviors and values – they so often undergo new styles. 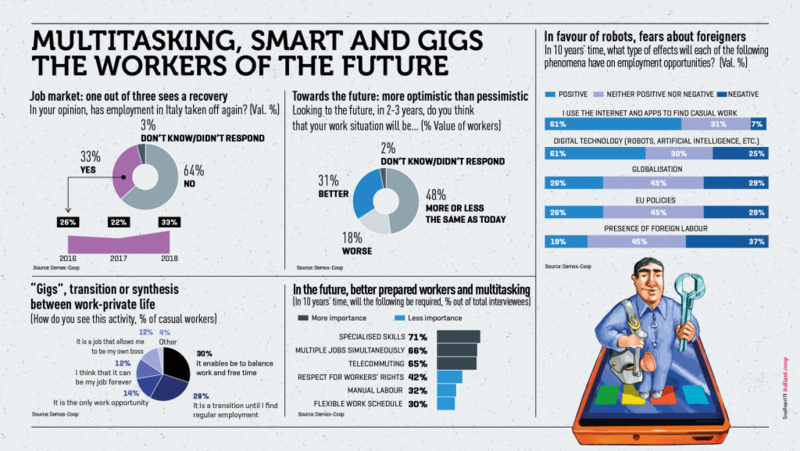 ​​At the opposite side we find the “nostalgic” (26% of the sample) who, thanks to a more uncertain economic condition, show a clear dissatisfaction with work and life in general. At least they are as contemporary as explorers, they’re part of the middle class that has experienced the hardest effects of the crisis. In the middle lies the rest of the country: a fluid magma still uncertain about the address to be taken. To unify a country so anxious and broken there are the values ​​of all the times (the family, work, health, food) and new priorities (environment and internet). 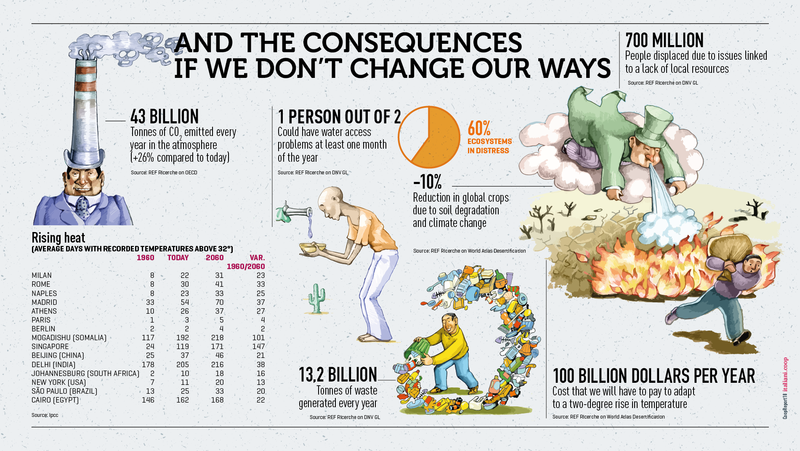 In their environmental awareness Italians are the most careful in Europe. 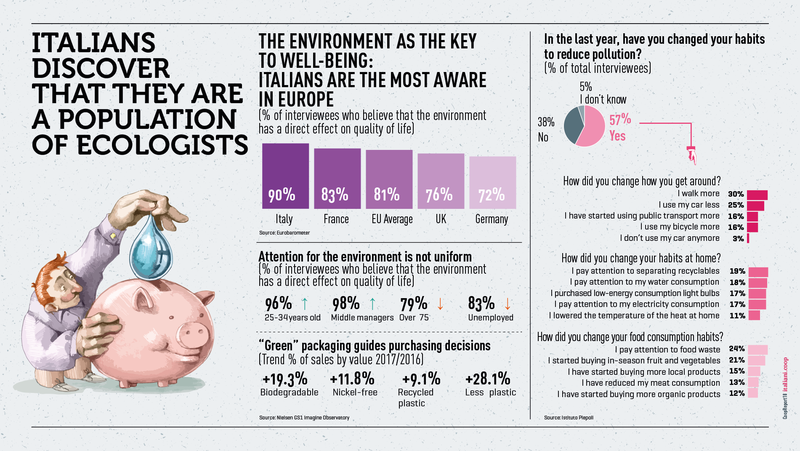 9 out of 10 Italians believe that living in a healthy environment is a fundamental condition for achieving a high quality of life (83% in France and only 72% in Germany). 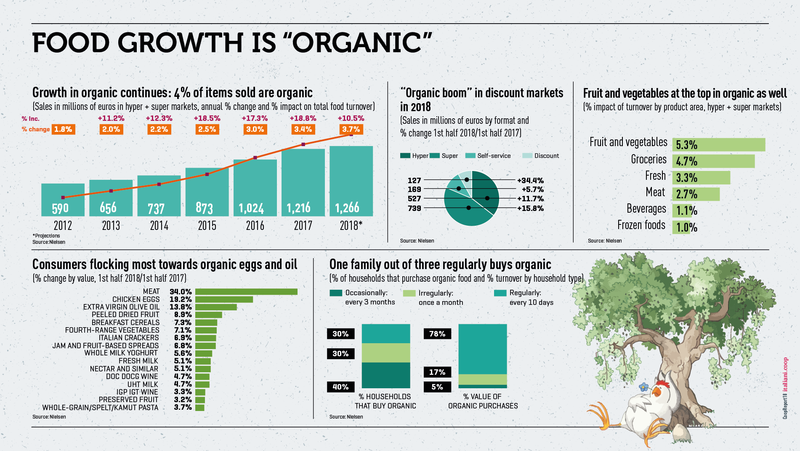 And in the shopping cart, ecological and sustainable products reached 2 billion euros in sales in the first half of 2018 (compared to 3.6 billion in the whole of 2017). 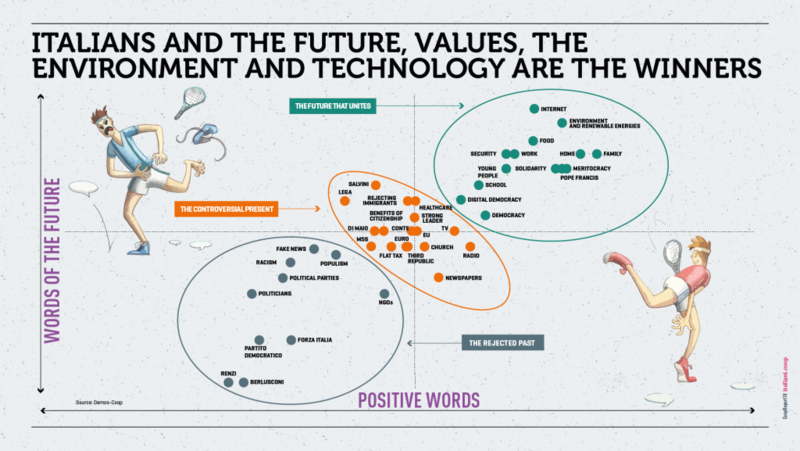 Internet and, more in general the digital technology, is still at the top of the Italians’ thoughts, but they show, if not skepticism, certainly a greater awareness of their use. 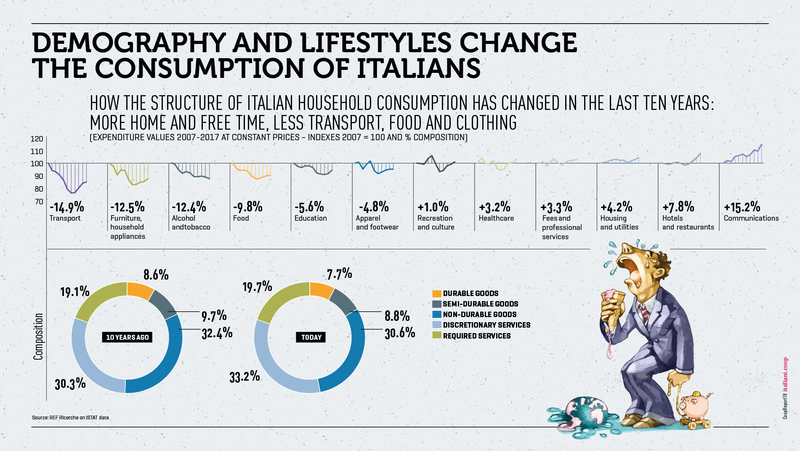 One Italian out of 3 recognizes that he has contracted a form of dependence on his smartphone (however, consumption continues to grow: + 3.6%). And on social media the small but safe square of Whatsapp has exceeded the much more crowded Facebook (82.9% vs 68.8% the percentage of daily use). 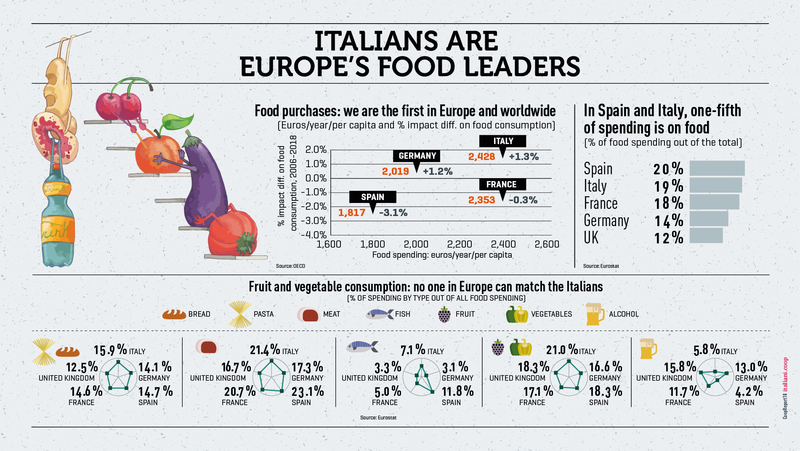 In terms of food, the Italians confirm their indisputable supremacy. 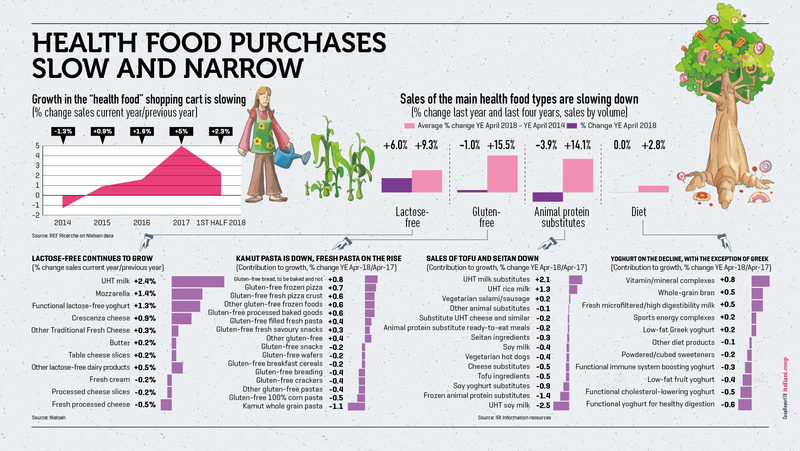 First for food expenditure in Europe and in the world (19% the share of spending for food and drinks, the highest in the last decade), have also been forerunners towards a balanced and healthy diet and still today favor purchases of fruit and vegetables (+ 8.6% the volume growth of packaged fruit and vegetables), bread and cereals, renouncing increasingly to sugars and fats. Healthyness, a winning trend in recent years at the table, however, shows the first signs of slowing down, probably due to a saturation reached at least in certain market segments: the “health” shopping cart still grows in the first half of a +2.3 % but it was + 5% in 2017. 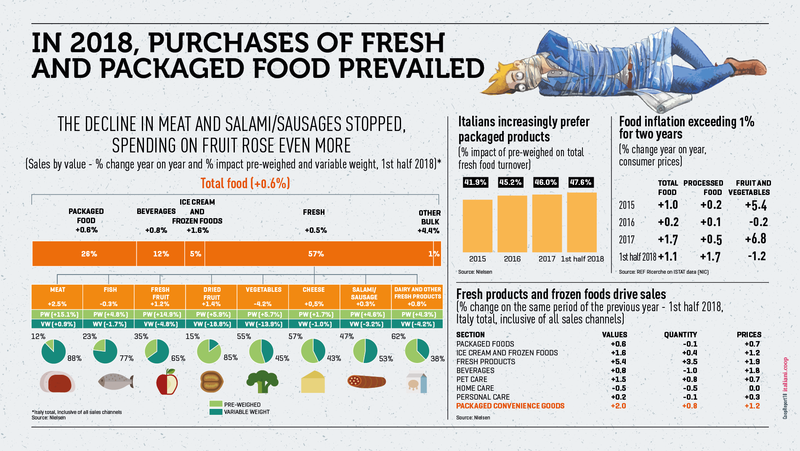 And even among the veg & veg, that recently appeared to be a dominant trend in terms of food, the first repentants appear in the last time: compared to an 8.3% still in line, 9.7% say they have been in the past and now have given up. The phenomenon of the moment in terms of food is certainly the “ready to eat” (ready to eat). 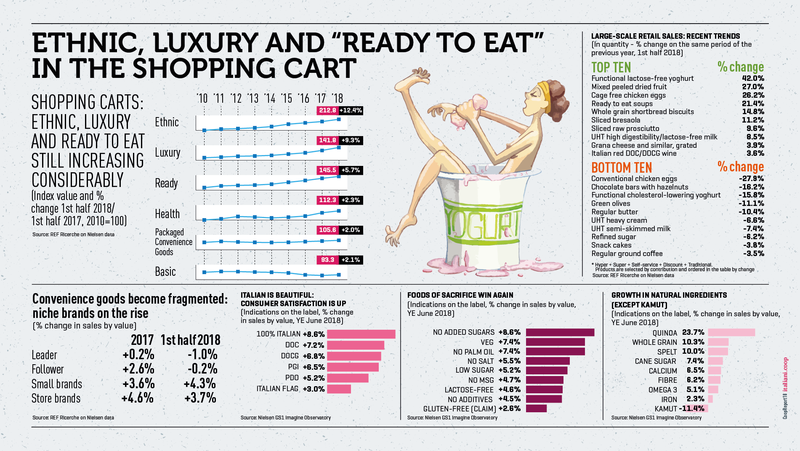 It is no coincidence that between the shopping carts, the ready food make a + 6% record and that e-food is increasingly a widespread alternative among Italians. 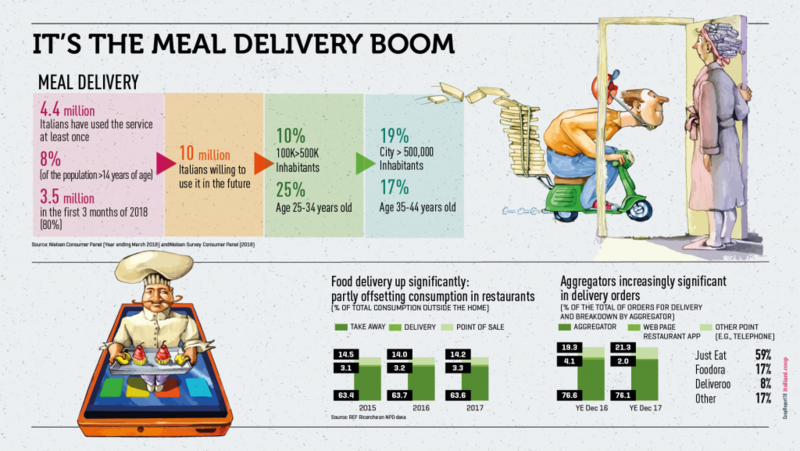 Only in the first three months of 2018, 3.5 million Italians (+ 80% compared to 2017) had bought food delivery, + 34% for online food purchases in the first 6 months of the year. Modernity goes hand in hand with tradition, the sense of belonging continues in fact to direct Italian consumers towards Italian products (+ 3%), favoring small brands (+ 4.3%) to the big brand. Only the affixing of the word “100% Italian” makes a 9% increase in sales.